It’s that time of year again when the Llanfrechfa Village Association holds it annual scarecrow competition. 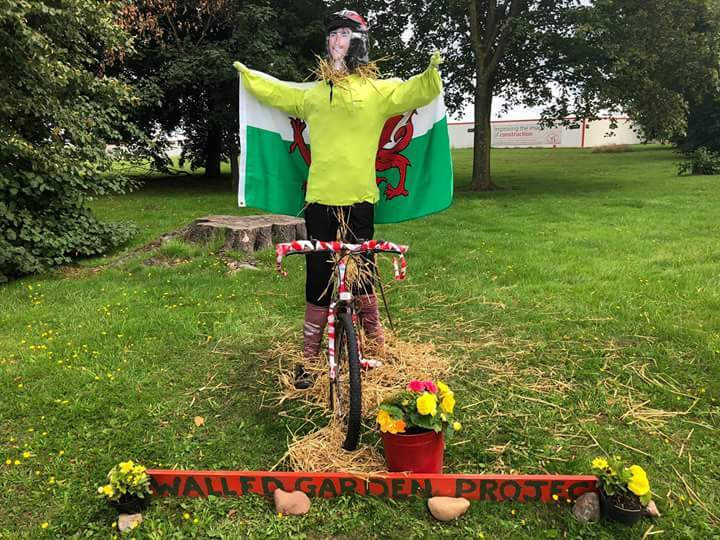 This year the Walled Garden project’s entry was Wales’ first Tour de France winner Geraint Thomas, complete with yellow jersey, Welsh flag and a bike! We know he rode like the wind during the competition but the day the team put him in place at the entrance to the Llanfrechfa Grange hospital site, it was so blustery he nearly took off! Thank you to all the volunteers who helped put him together. Our scarecrow was awarded joint 2nd place by the Llanfrechfa Village Association which we are very pleased with. The winner was War Horse, commemorating World War 1 by Caerleon and District, which was very well done. You can find pictures of the other entries at the Llanfrechfa Village Association’s Facebook page.